Next in order of age are 4 pigs made from jade and agate shown below maybe from China's Han dynasty (206BC -220AD) as they exhibit the characteristics and carving styles of Han dynasty pigs. 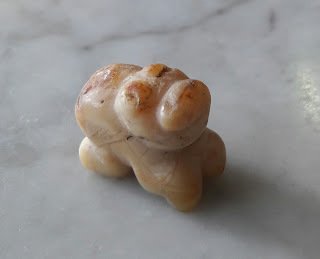 The Han pigs are long and lank carved with the Han ba-dao (8 cut) style. The top two pigs are carved from jade and bottom two are made from agate. The bottom two are also beads as the have perforations. 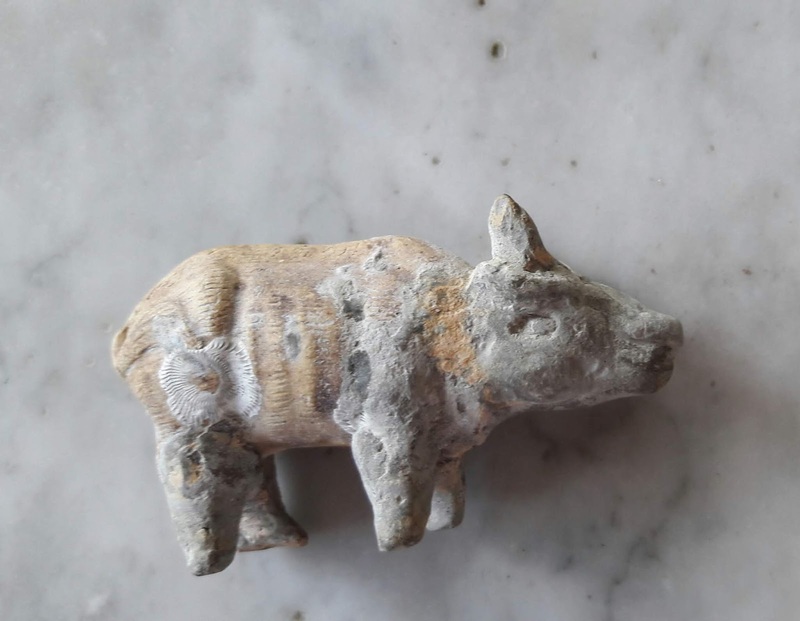 A pottery pig from Tang dynasty (618-906AD) is shown in following picture. 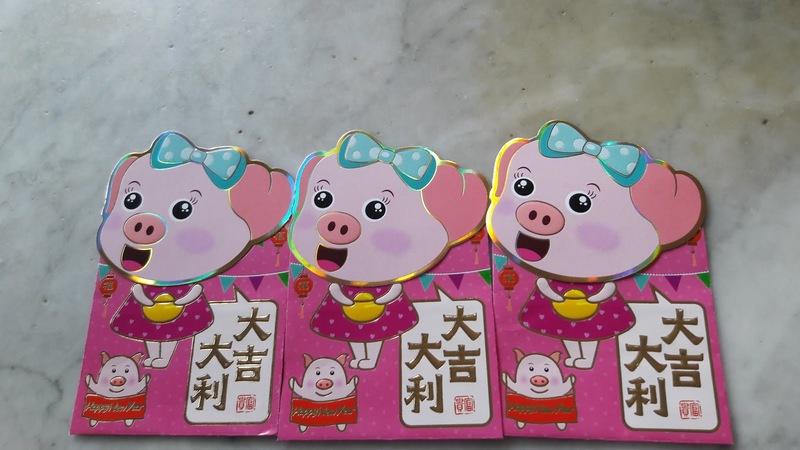 The ancient piggies are a bit sombre coloured and so to add de rigueur festive color to this post are 3 little pinkie piggy ang pows. 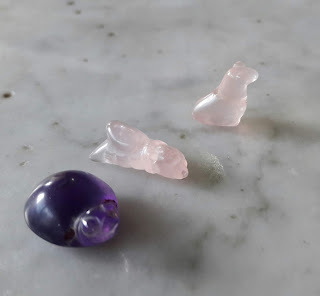 ...these are some of my favourite beady things that I'd like to share during this season. All three creatures are beads and have perforations for stringing. 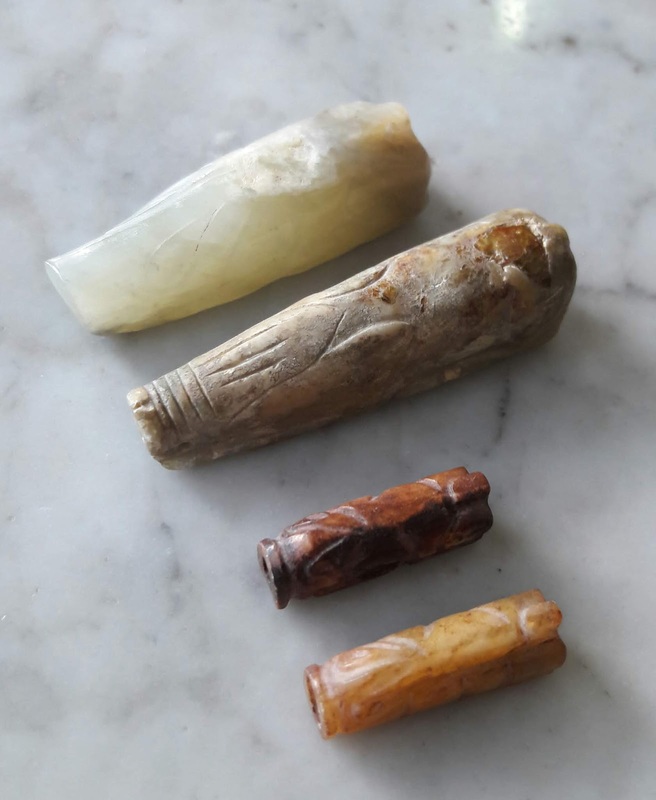 They may date as far back as the Pyu dynasty (around 2nd century BC to 11th century AD) and comes from Myanmar. Here's a closer look at each of them starting from the amethyst turtle. 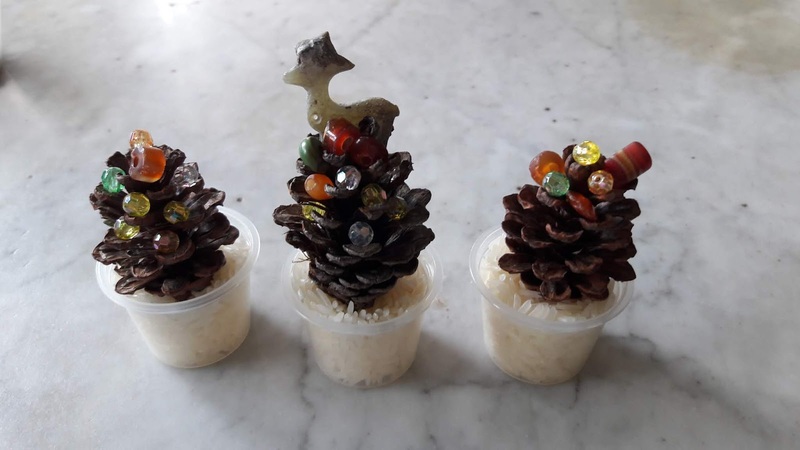 And to wish beaders and collectors all over the world a Merry Christmas and Beadiful New Year, I have decorated pine cones with assorted beads and topped them with one ancient jade (rein)Deer. 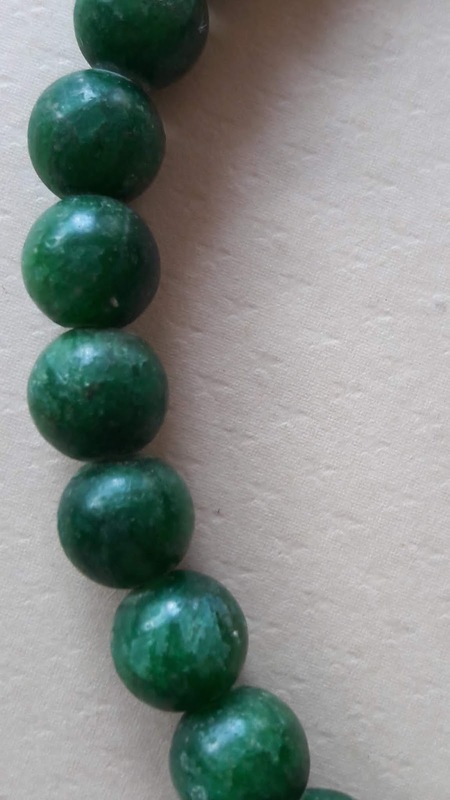 At a glance the dark green beads resemble jade but are actually made of glass. 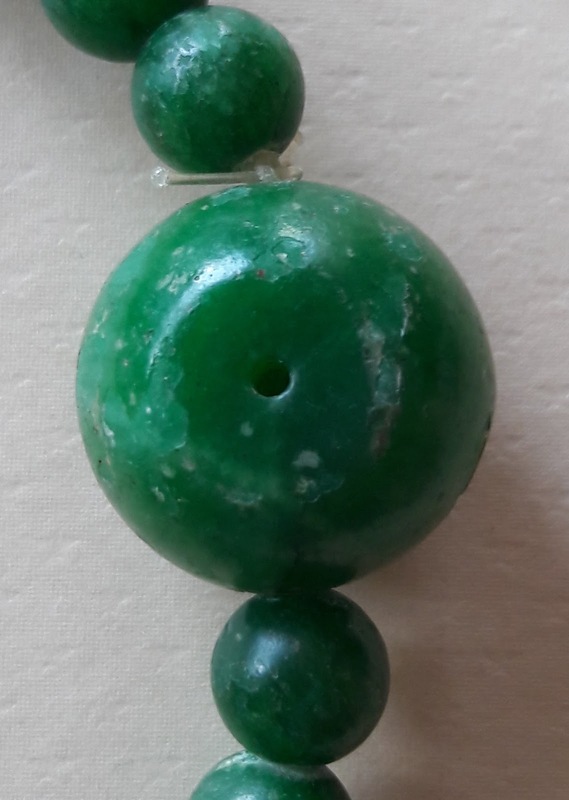 Could this be a 1920s necklace ? 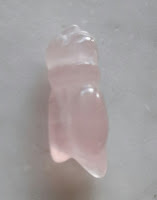 Because the glass, on examination is not so well made and the bead ends show a whitish powdery substance, it may well be modern. 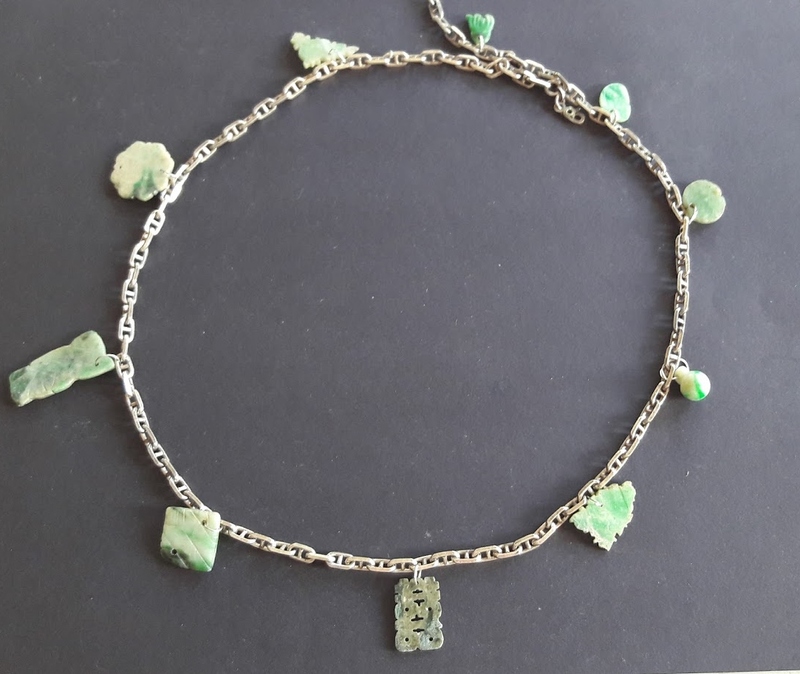 Nevertheless it does look rather attractive at a glance. a perforation in the largest bead. 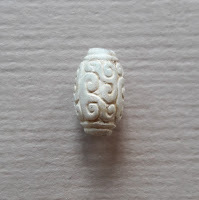 Nevertheless it sits well on my old celadon vase. 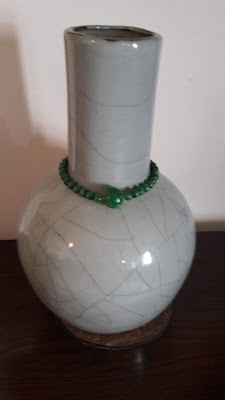 Green bead necklace on old celadon vase. A set of ancient jade ornaments comprising 10 tubular jade beads strung with turquoise beads, a small slit ring (jue), a small disc (bi)and a small huang. 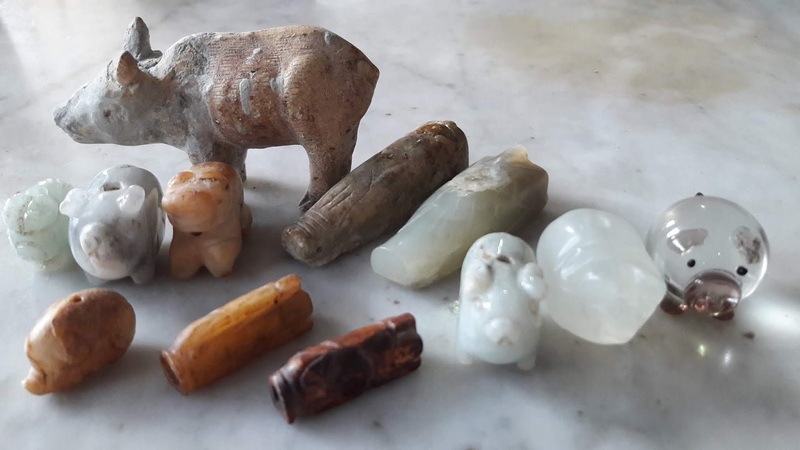 All purchased in Hangzhou and purportedly from the Liangzhu Culture (3300-2300 BC) The stone, patina, and shape of the items do resemble Liangzhu artefacts so there is a good chance that these are of the period. Also Hangzhou is the site of Liangzhu culture makes the possibility more likely. 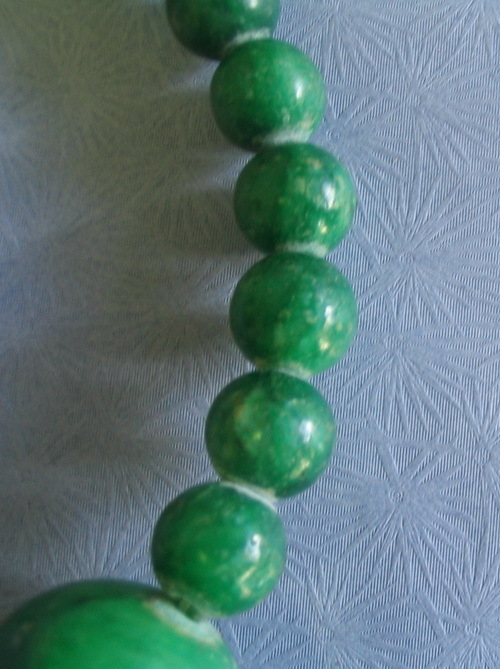 The ten tubular beads are interspersed with turquoise beads which may not be from the same timeline. 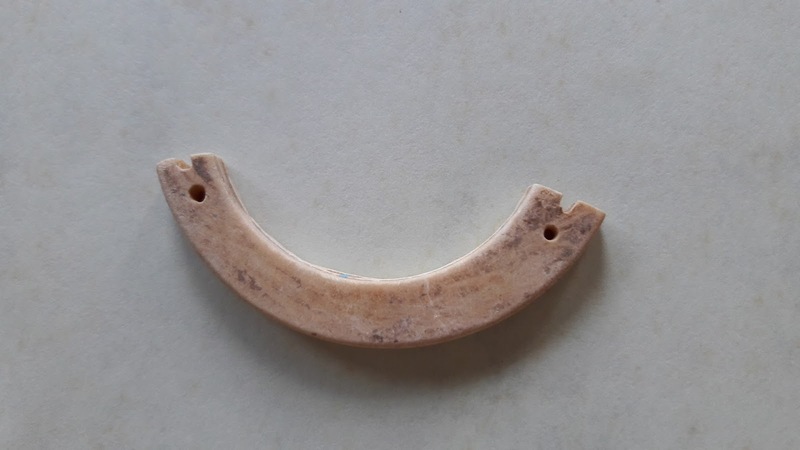 The small arch shaped huang measures 5cm and must have been part of a longer necklace. 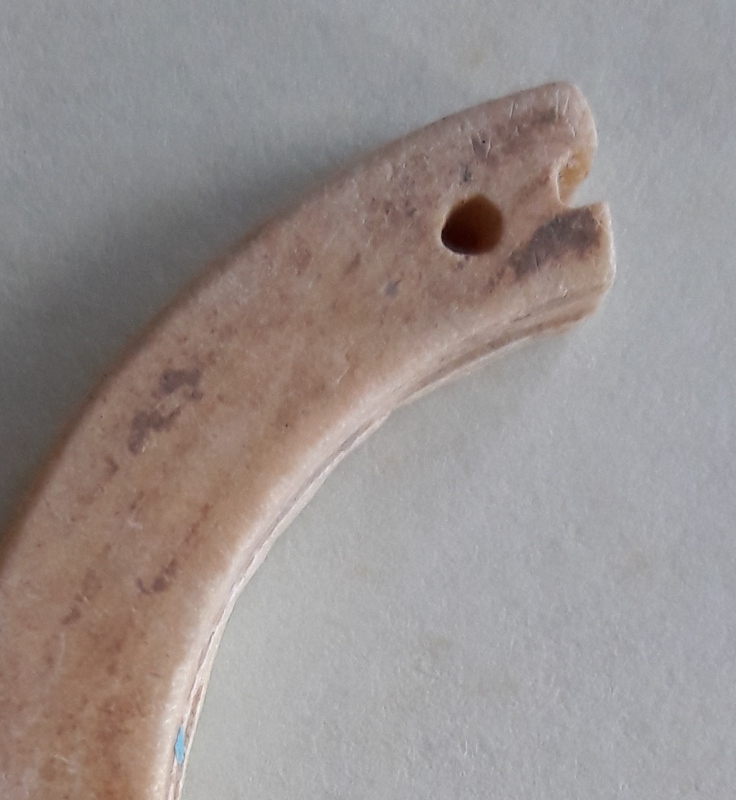 Each end of the huang is drilled with a hole and a groove. 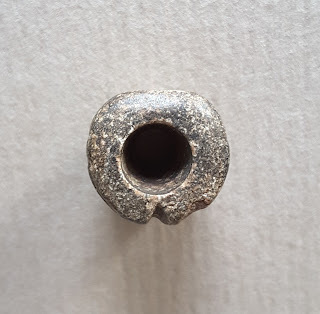 The hole and groove at both ends may represent they eyes and mouths of a dragon. 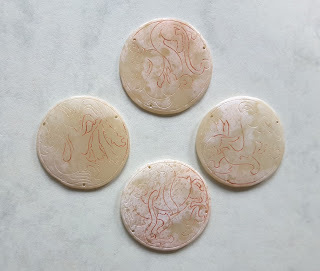 Later versions of jade huangs have dragon carvings at both ends so this may be an early version. This is entirely my own conjecture. 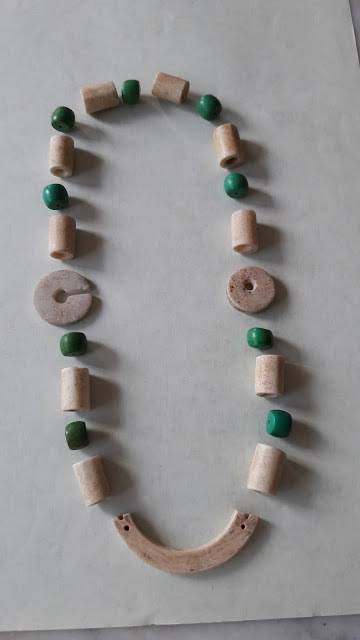 Unlike large ceremonial ritualistic objects of the Neolithic period, these ornaments are small and minimalist but have a life of their own If these beads and ornaments were exhibited in a museum, would they be arranged as below ? The jade is a light olive green, infused with cloudy white patina which does not corrode the jade. Instead oddly it seems to enhance it. 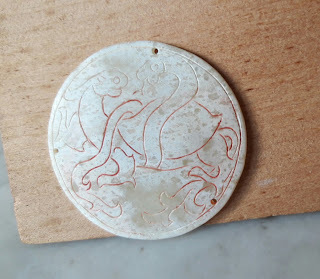 With white patina blooming all over them I cannot help but guess they are ancient pieces but I cannot really identify the exact period or which Chinese cultural group they belong to. Which dynasty and which Chinese cultural group? 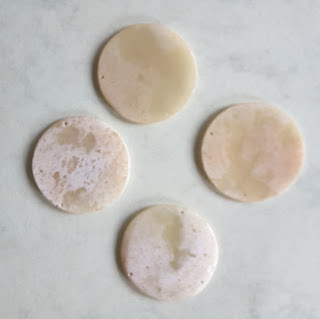 Round shaped and measuring 3 cm diameter, each plaque has 3 small holes drilled near the edge . 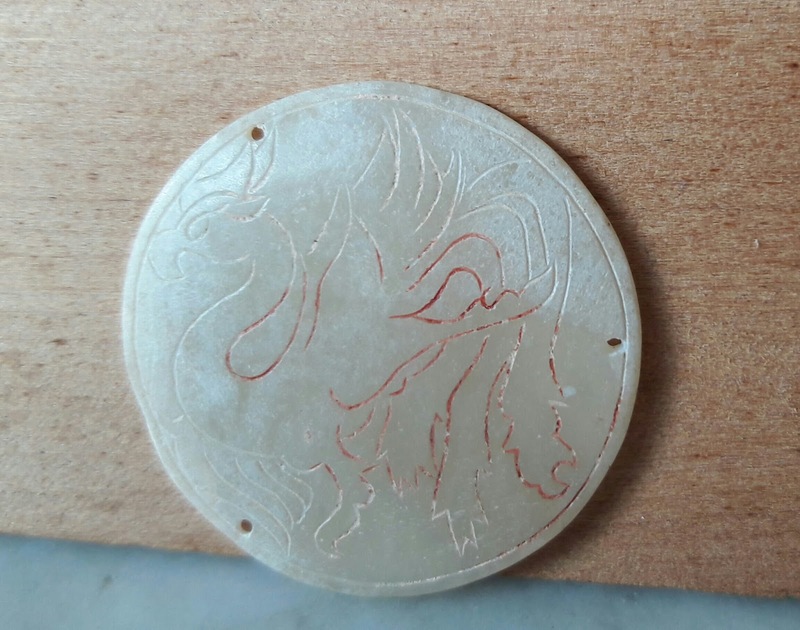 Each piece has a carving of mythical animal on one side. The line carvings retain traces of cinnabar. 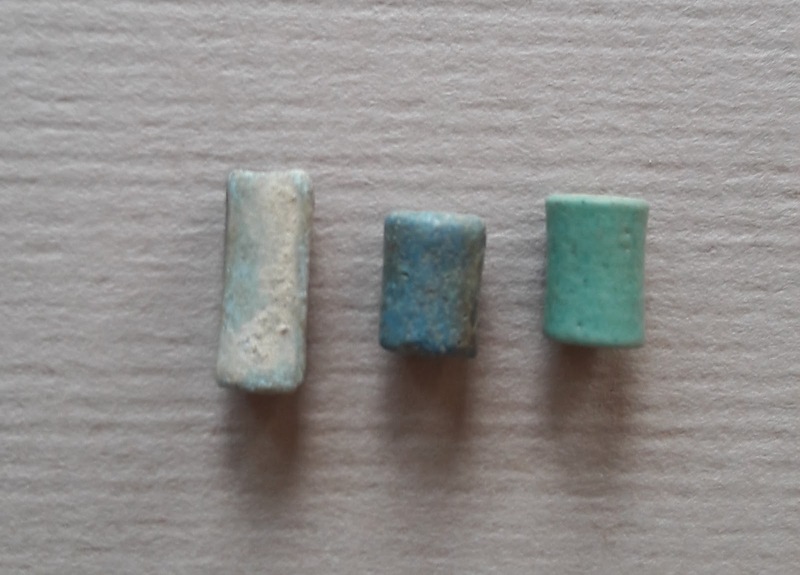 Not sure if these red lines are the remains of cinnabar or some dealer just outlined it in red to make the drawings stand out. 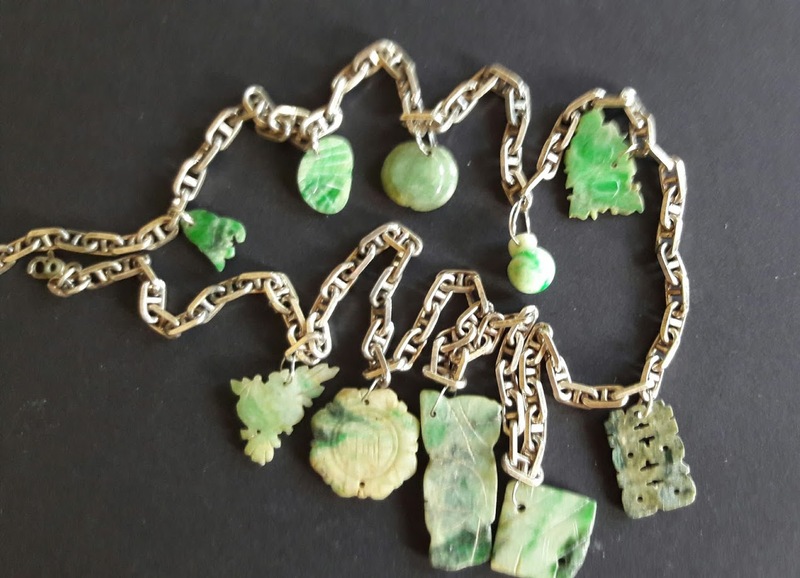 I have soaked the pieces in soapy water and the red lines have not disappeared. The reverse side is plain. 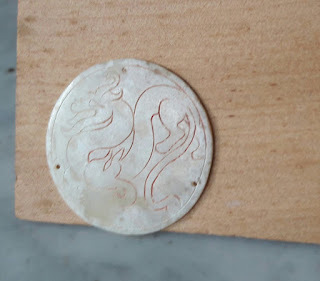 To add to the mystery each plaque is also very thin. What tools were used to carve these mythological animals without damaging the delicate jade. 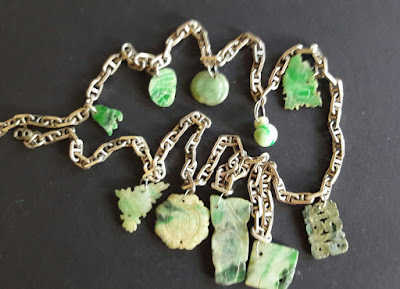 Or are these jade of younger vintage, although patina says otherwise. 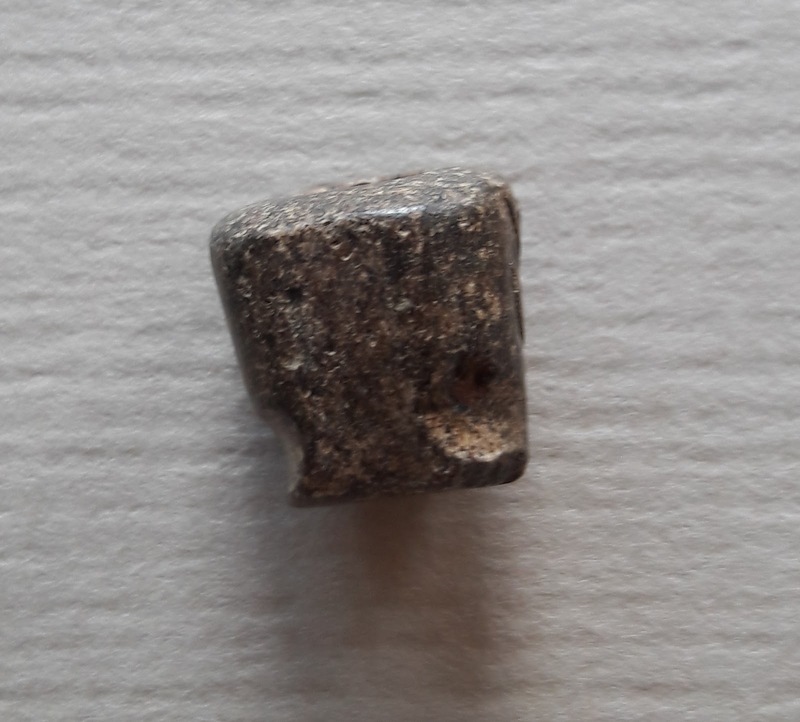 Another possibility, were drawings newly added using modern tools ? 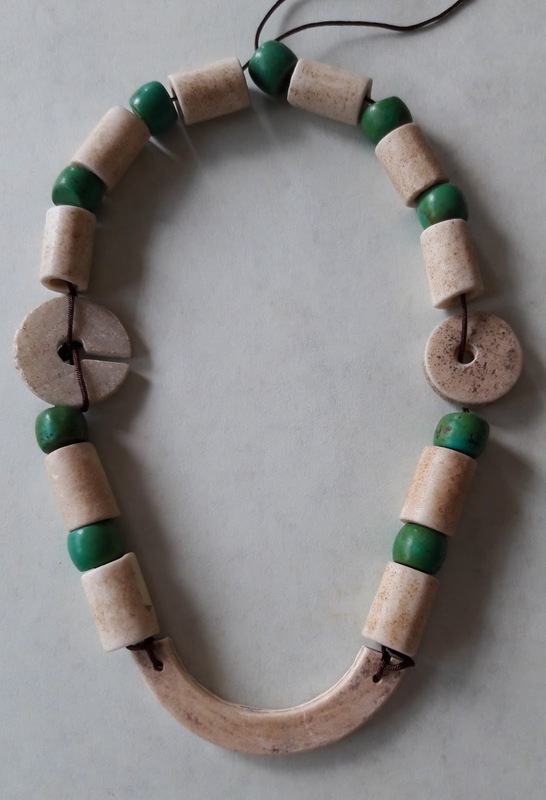 Finally, were they used as pendants, or worn as belts, strung as chatelaines or hung as part of a veil ?? 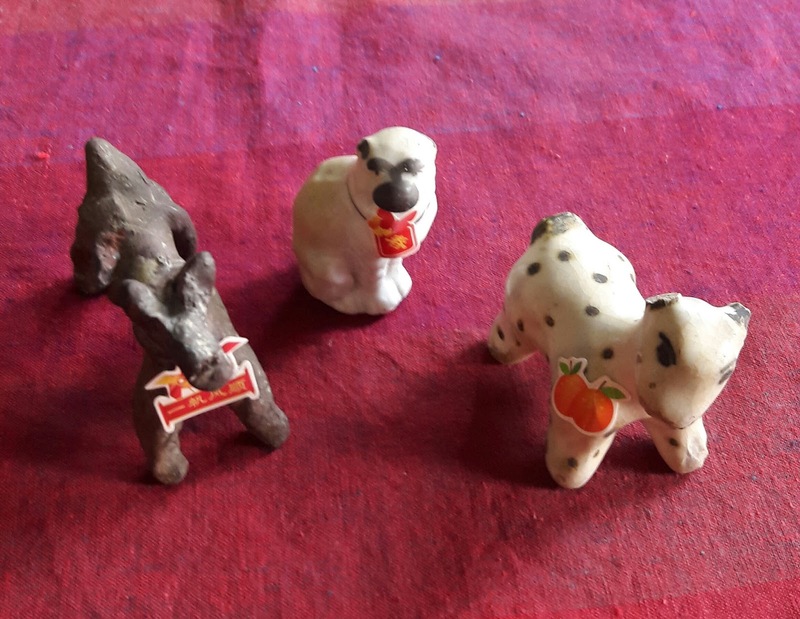 Whatever, their history or vintage, I would still find them attractive and collectible. 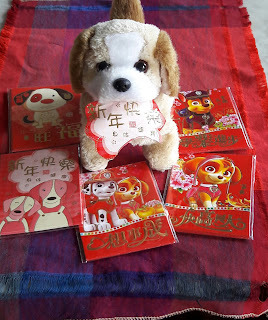 To usher in Year of the Dog 2018 I have assembled 9 Doggies from my collection. Here are the first 3 which hail from different periods of Chinese culture or history bearing auspicious greetings on them. 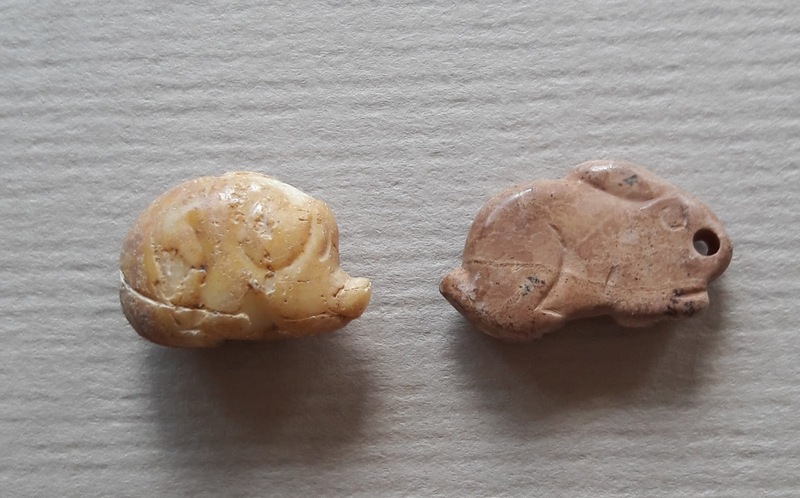 Spotted dog on the right from Cizhou kilns of Sung dynasty (960-1279 AD) In the centre dog with black nose likely from 19th century and brown dog on left may date as far back as Chinese prehistory. More doggie themes on snuff bottles and one carved from rock crystal shown below. 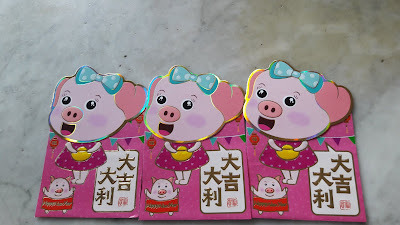 Strictly speaking these three are not mine but borrowed from Heng. 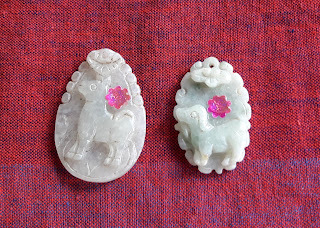 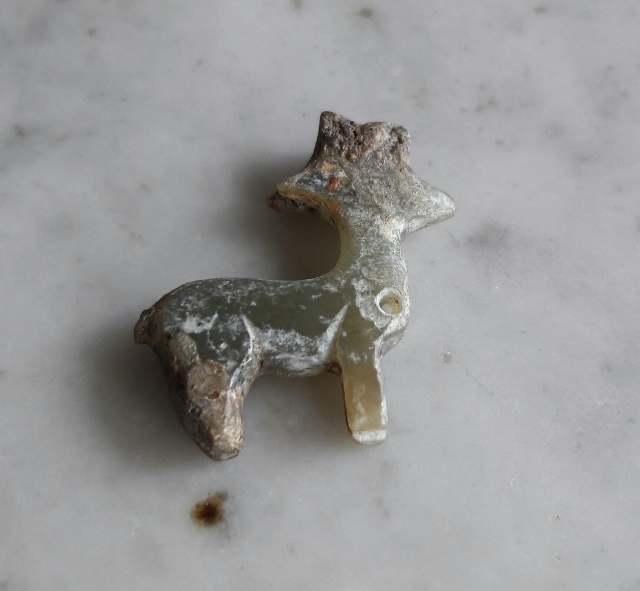 White jade pendants with dog carving. 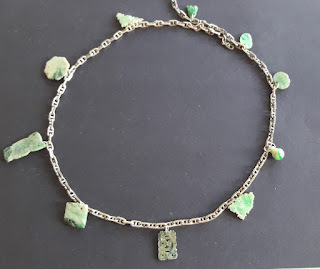 I have found yet another use for my miscellaneous jade charms. 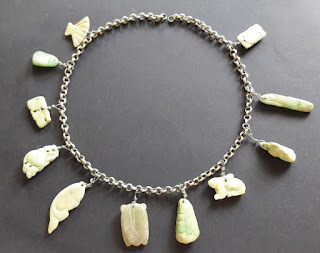 By attaching them to a vintage silver chain, a " jade lei" is formed. For me the meaning behind my jade lei is just my love for jade, and here's a closeup look at my lucky charms. 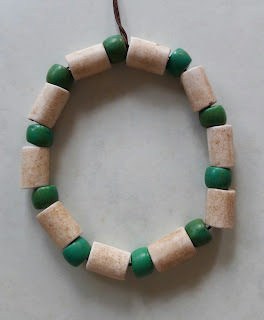 The second lei I made mostly from white and off white pieces of vintage jade. 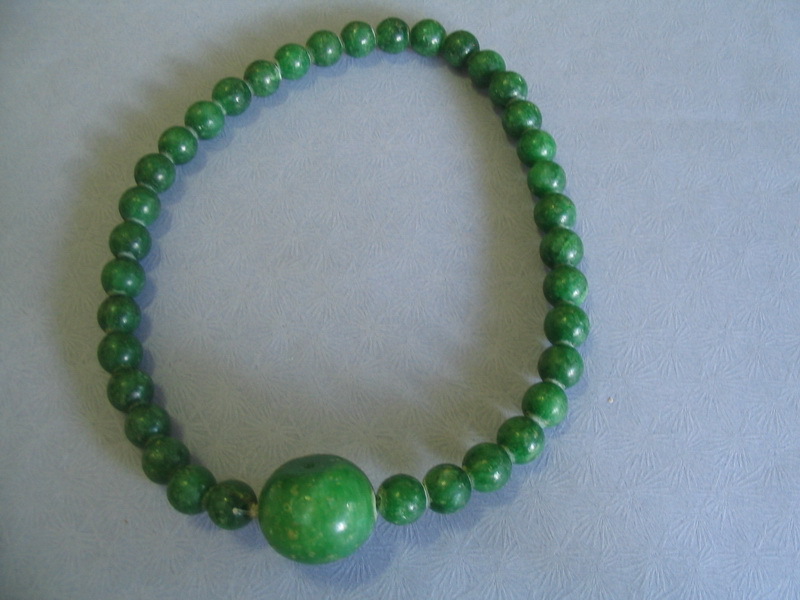 Although carved from lower quality jade the charms in the second lei are no less interesting. 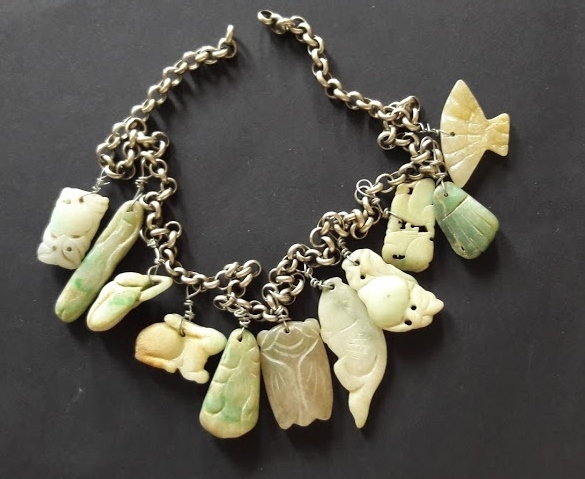 An eclectic assortment of jade charms including animals and insects, as fish, rabbit, cicada and several fruits, a hand and a fan are represented in the closeup below. This group of beads and pendants is made up of an interesting mix of bird and animal forms together with cylinders, barrel and tabular shapes. 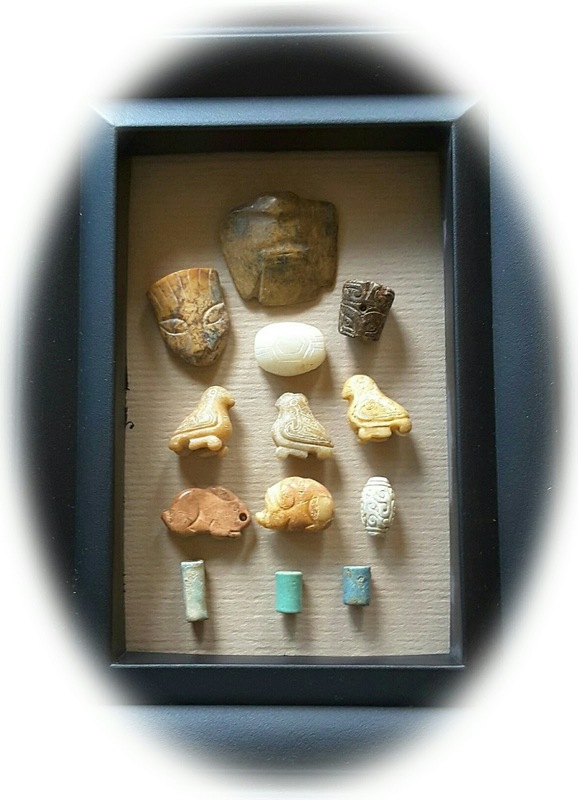 As they show characteristics of the middle Neolithic, Shang, Xizhou and Han dynasties (about 4000 BC - 220 AD) I am relating them broadly to these periods. 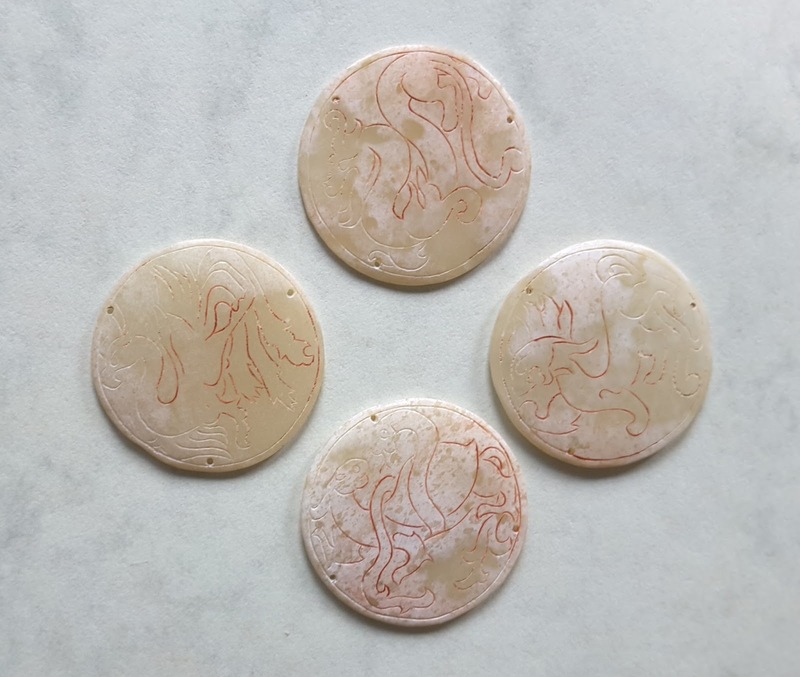 There are four birds in the set and I have a soft spot for the first three. Each bird measures approximately 2cm x 1.7cm. 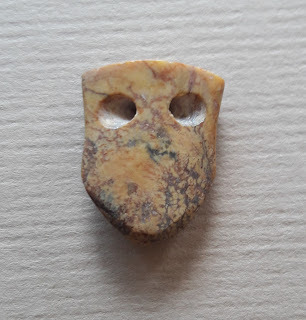 They have line carvings all over their bodies with holes drilled from head to feet and must have been used for stringing. 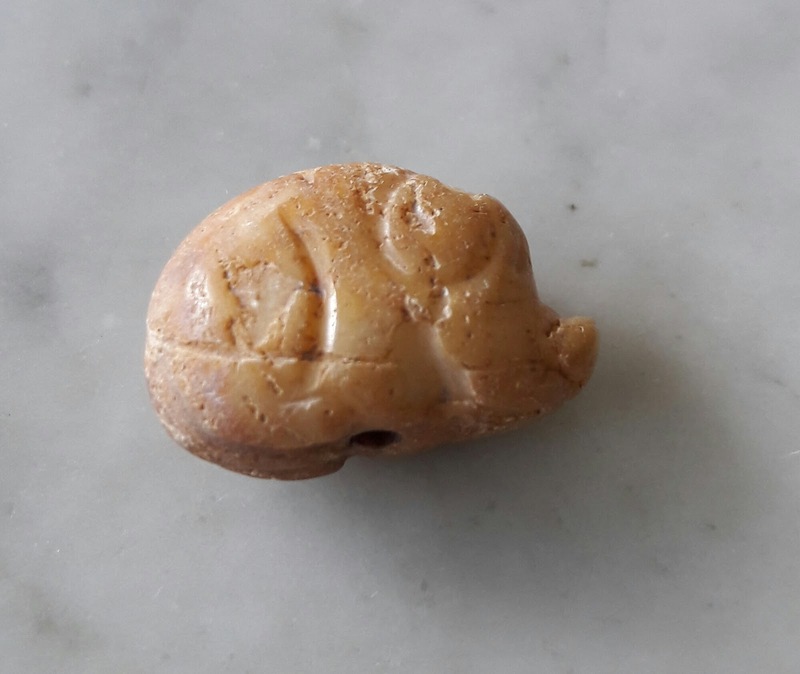 Could date from Han dynasty (206BC- 220AD) or earlier. The fourth bird with outstretched wings is also one of my favourites. 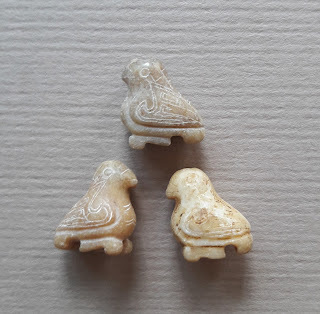 Such birds have been recovered from Hongshan Culture sites (about 4700Bc - 2900BC) but it's hard to confirm whether mine is Hongshan or Shang dynasty (1600 -1046BC) vintage. 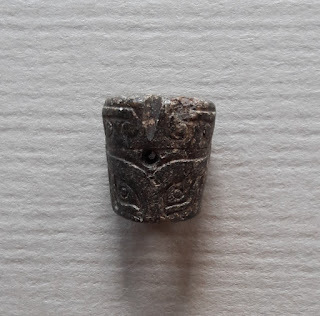 Because of its smaller size 3.2cm x3 cm I tend to believe it is a Shang model. This is a soulful looking bird and the stone has been abraded to show raised eyes and breast. 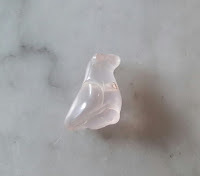 There is also a centre band with minimal carving below the breast. 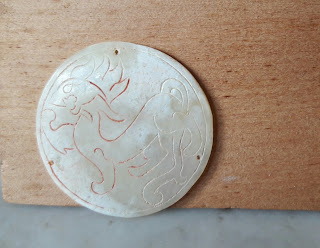 The reverse shows ox nose suspension holes and a pair of grooves around the tail and wings. 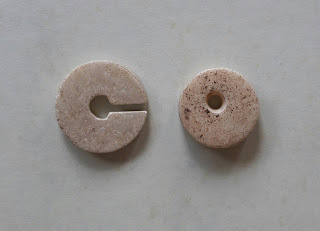 Toomarks are seen in the holes and grooves. 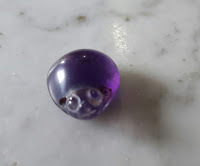 Next are 2 small animals, a pig bead (2cm x 1cm) pierced from top to bottom and a rabbit pendant (2.2cm x 1cm)with attachement hole at the nose. 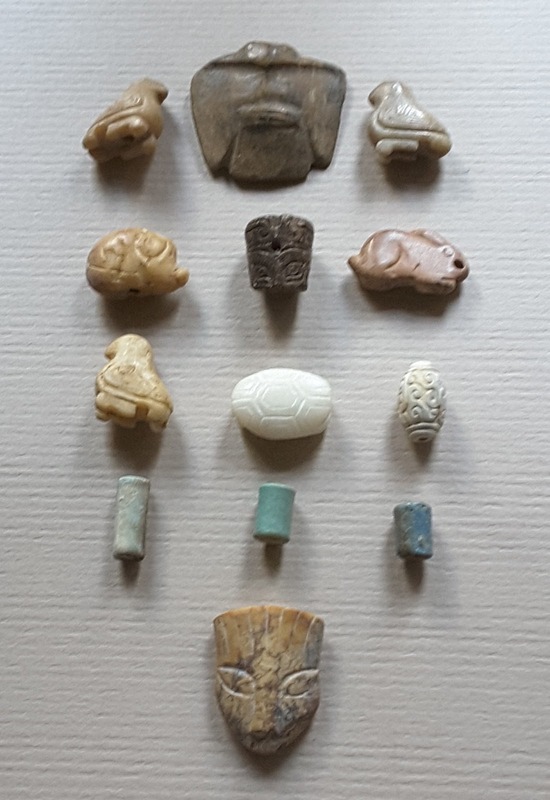 I speculate that these are from Xizhou dynasty (1046-771 BC) which has many tiny animals in its repertoire. 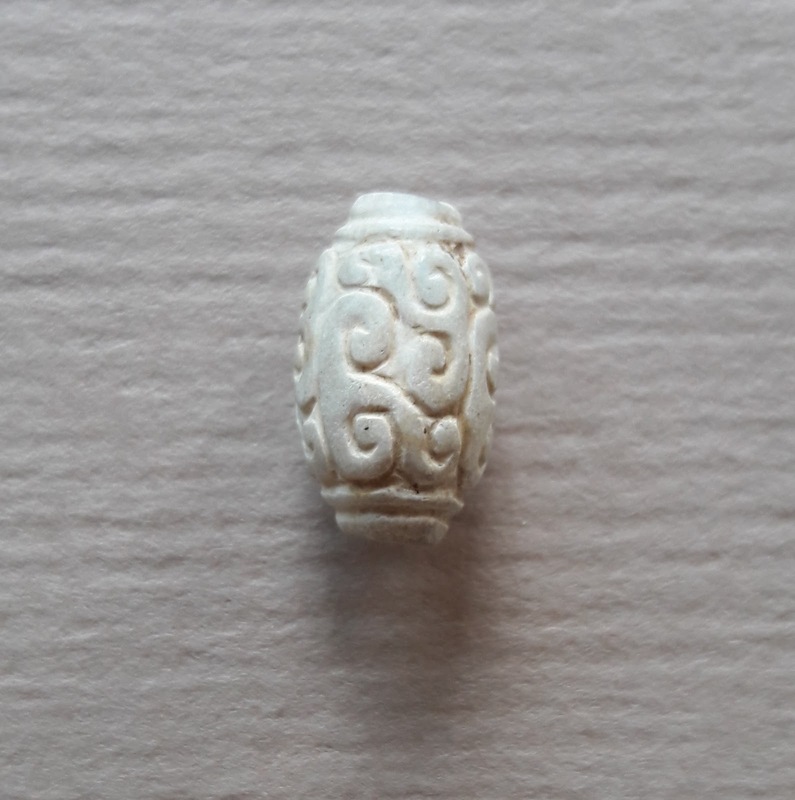 Barrel bead is 1.4cm long with a foetus like (or maybe its a silkworm) carved in high relief, with double collars on both ends. 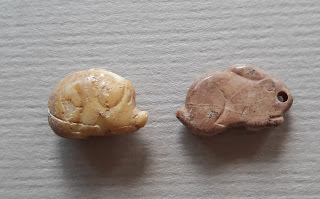 Need to do further research on the carving style to establish its time in history. 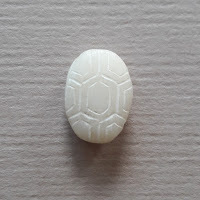 There are grooves on both sides of the bead. 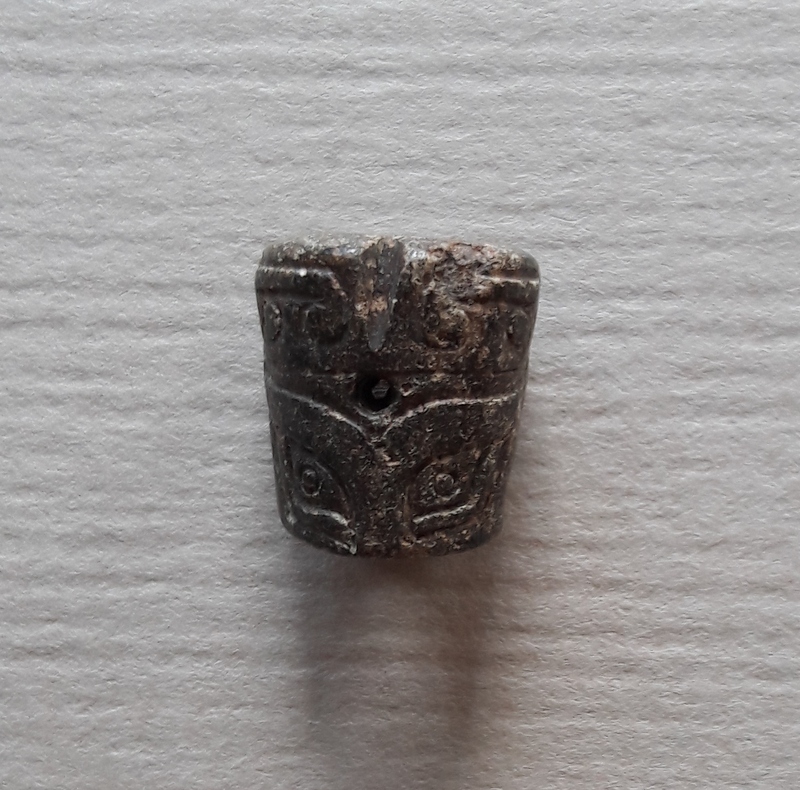 The taotie is a mofif commonly found on Chinese ritual bronze vessels from the Shang and Zhou dynasty. 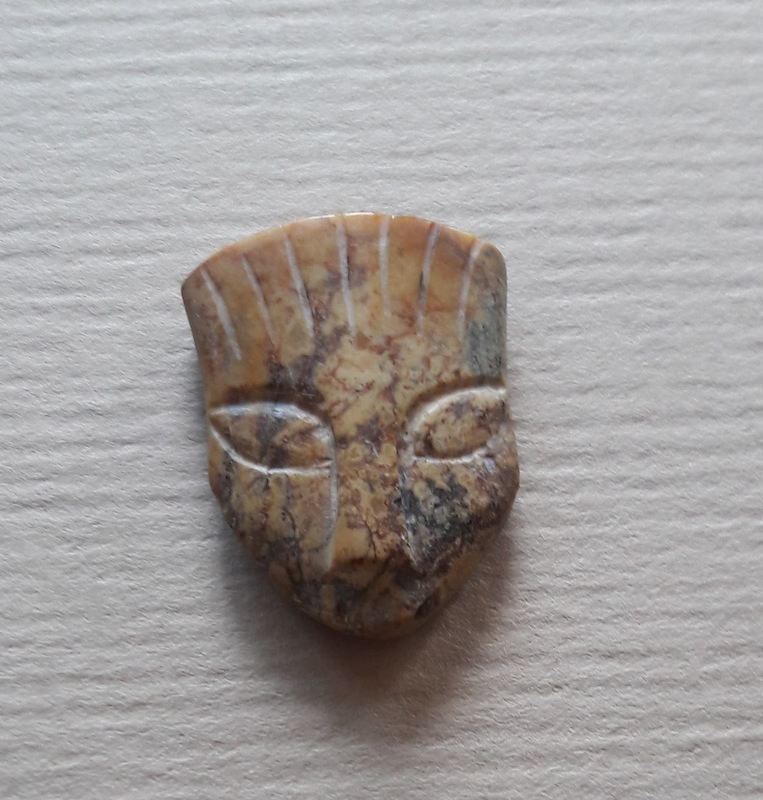 The design typically consists of a zoomorphic mask described as being frontal, bilaterally symmetrical with a pair of raised eyes and no lower jaw area. 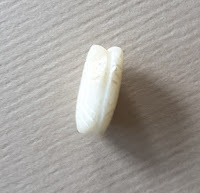 The specimen I show measures 1.2 cm , is curved inwards ,with the top wider than the bottom. 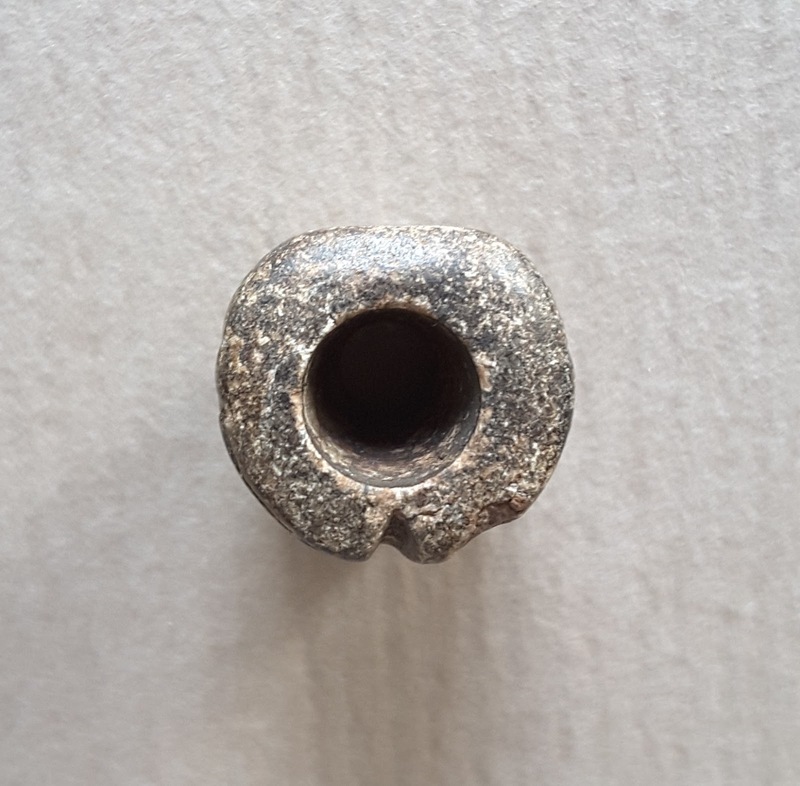 It has a large drilled hole from top to bottom with the top part of the hole larger than the bottom and another perforation in the centre. 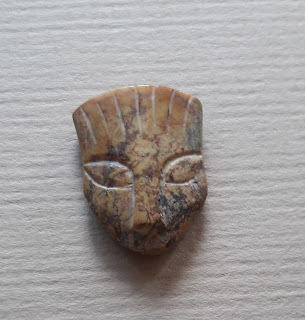 The curved surface shows a pair of slanted eyes with cloud pattern eyebrows but lacks a lower jaw or mouth. Beads of this ilk have been used among other things, as finial or closing device for necklaces particularly in the Xizhou dynasty. And the uncarved reverse is slightly curved with two dents at both ends. I am not sure what purpose the dents serve. Last but not least is the pendant with monster head motif. 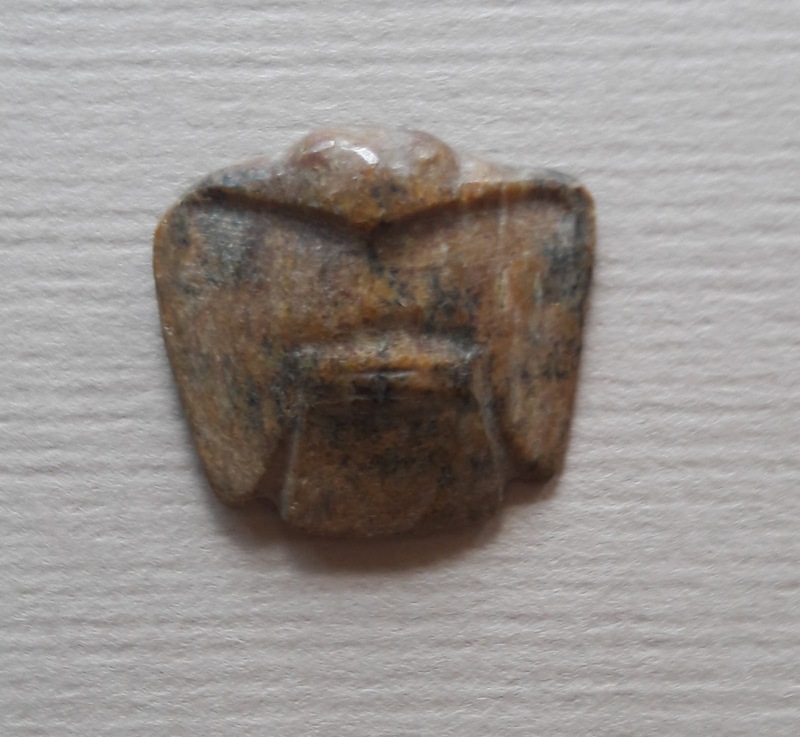 It is decorated with striations at the top of the head perhaps indicating hair, with large slanting eyes and long nose but the mouth is not shown. Not sure whether this is the head of a monster or some fearsome animal but its portrayal is simply unforgettable. 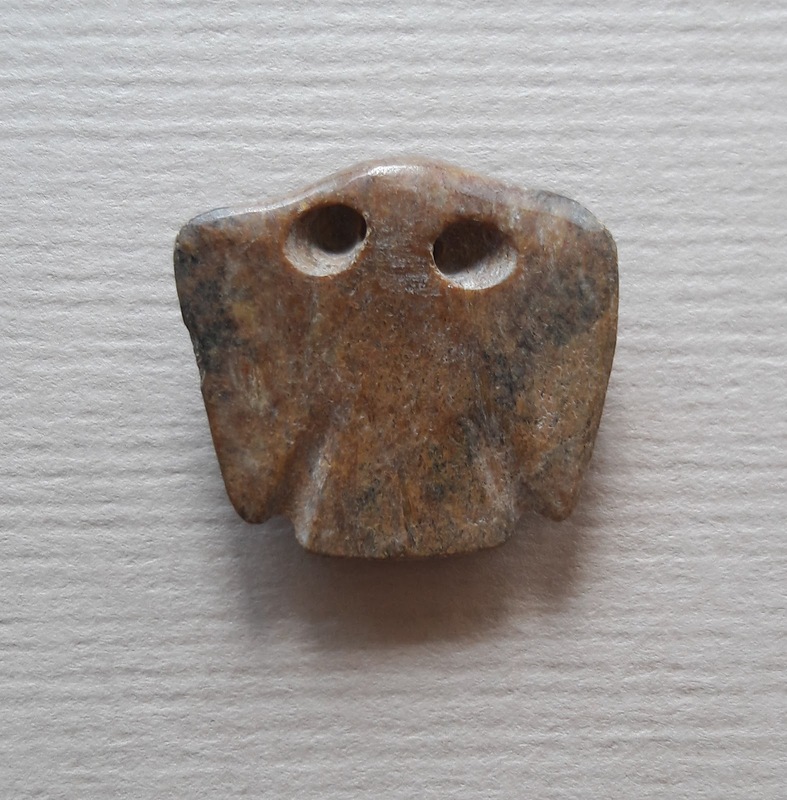 It measures 2.7cm x 1.8cm This bead pendant may be as early as Neolithic times. Monster head or wild beast ? And to round up here is my priceless collection of ancient beads, birds, animals, monsters and taotie again. 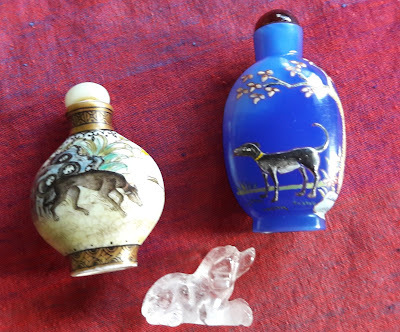 In praise of ancient Chinese ornaments. 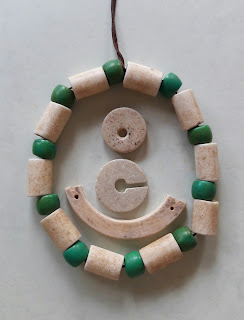 I am also apologetic that I am not clear about the names of the stones or minerals that these ornaments were made from.